Play along to your favorite tunes with the benefit of isolation. Vic Firth's SIH1 headphones are specially designed to drastically reduce the level of external sound from reaching the musician's ears‚ offering valuable protection from potential damage. 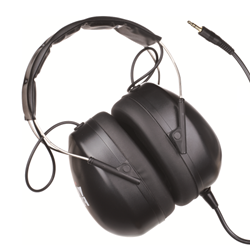 The SIH1 Stereo Isolation Headphones reduce overall noise levels by 24 decibels. Unlike non-isolation headsets – where musicians typically crank the volume to very high and potentially damaging sound levels in order to hear the music clearly – the SIH1 reduces ambient noise from the instruments. This allows the musician to play along with the recorded music or monitor other performers in a live situation at comfortable and safe sound levels.